The NFL has played Pro Football on Thanksgiving since 1920, although records indicate that “professional” football that pre-dates the NFL was played on Thanksgiving as early as 1892. We’ve pulled together some fun facts and history about the NFL’s traditional Thanksgiving Day Games that you may not have known. If you are any kind of football fan, you probably already know that the NFL traditionally hosts Thanksgiving Day games in both Detroit and Dallas. Since 2006, there has also been a Thursday evening game played at various locations. Here are some lesser know facts about the NFL’s holiday tradition. As of 2018, The Detroit Lions have the most wins on Thanksgiving (37), as well as the most losses (39). The tradition of the Detroit Lions playing on Thanksgiving Day began in 1934. The Lions have played on every Thanksgiving Day since 1934, except during 1941-1944 when no games were played due to WWII. The Dallas Cowboys have the 2nd most Thanksgiving wins behind Detroit. The Cowboys are 30-19-1 all-time (as of 2018). The tradition of the Dallas Cowboys playing on Thanksgiving day began in 1966 when the Cowboys were still part of the AFL. The St. Louis Cardinals replaced the Dallas Cowboys on Thanksgiving during the 1975 and 1977 seasons. Dallas has hosted in every other year since 1966. Troy Aikman’s 455 passing yards vs. Minnesota in 1998 is most of any QB on Thanksgiving. Matthew Stafford has the most career passing yards on Thanksgiving. Stafford surpassed Tony Romo’s career mark in 2017 vs. Minnesota. Tom Brady (2010 vs. Detroit) and Dave Kreig (1994 vs Buffalo ) are the only 2 QBs to post a perfect passer rating of 158.3 on Thanksgiving. Ernie Nevers holds the record for most touchdowns during a Thanksgiving game with 6 in 1929. The modern day mark is held by Sterling Sharpe who scored 4 TDs vs. Detroit in 1994. The Green Bay Packers have the 2nd most Turkey Day losses with 20. Two QBs have thrown 6 TD passes in a Thanksgiving game. In 1977, Bob Griese tossed 6 TDs passes in a 55-14 win over the St. Louis Cardinals, while Peyton Manning matched that feat by throwing 6 of his own during a 41-9 win over Detroit in 2004. Tampa Bay & Cincinnati are the only current NFL teams to play on Thanksgiving and not have at least one win. They are both 0-1. OJ Simpson has the most rushing yards in a single Thanksgiving Day game with 273 vs. Detroit in 1976. The Vikings have the highest winning percentage of any team on Thanksgiving with more than 1 appearance. They are 5-1 all-time. The record for most pass receptions in a game is 12 by both Colts WR Marvin Harrison (2004 vs Detroit) and Lions WR Brett Perriman (1995 vs Minnesota). The most receiving yards on Thanksgiving was 303 by Cleveland’s Jim Benton in 1945. The most since then was 188 by Andre Johnson of Houston in 2012, followed by 185 by San Diego’s Lance Alworth vs. Buffalo in 1964 and 184 yards by Minnesota’s Anthony Carter in 1987 vs Dallas. The Chargers played on Thanksgiving in 2017 for the first time since 1969. In 1998, Dallas’ Troy Aikman (455 yards) and Minnesota’s Randall Cunningham (359 yards) combined for 814 yards passing in a single game. Other than the Cowboys who have done it three times, the Dolphins are the only other team to win a Thanksgiving day game, and the Super Bowl in the same season. Miami did it in the 1973 season when they beat Dallas 14-7 on Thanksgiving, and then won Super Bowl VIII over the Vikings 24-7. 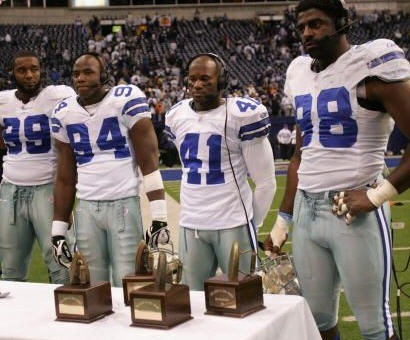 From 2006-2011 the NFL Network broadcast the Thanksgiving evening game. Beginning in 2012, NBC has broadcast the Thanksgiving evening game. “Red” Grange made his professional football debut for the Chicago Bears on Thanksgiving in 1925. It may seem like these often goofy awards have been around forever, but the tradition of a Thanksgiving Day award began in 1989. 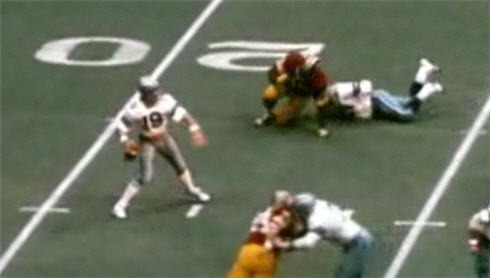 John Madden (then with CBS and later with Fox) began awarding the “Turkey Leg” to the player chosen as the MVP of the game. The initial recipient was Hall of Fame Defensive End Reggie White of the Philadelphia Eagles. 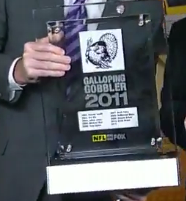 The Galloping Gobbler replaced the Turkey Leg in 2002. The Trophy has gone through a few changes since over the years. It initially consisted of a Turkey in a Heisman-Trophy-like pose. 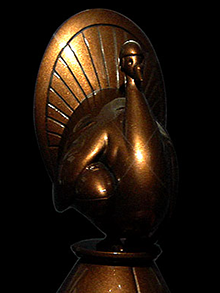 The “Gobbler” later switched to a bronze-like statue of a Turkey with a football. In 2011, the look of the Galloping Gobler switched to a clear plaque with an engraved image of a turkey. When NBC broadcast the AFC games, they never had an award. After CBS took over broadcast rights for the AFC games, they started awarding the All-Iron Award in 1998 with Phil Simms as the presenter. The All-Iron Trophy is a metal iron on a wood base. Herman Moore of the Detroit Lions was the first recipient. NFL Network gave out a “Pudding Pie” award from 2007-2011. NBC took over the evening broadcast in 2012. With the Cowboys trailing 23-3, unknown backup Clint Longley entered the game for the injured Roger Staubach and led Dallas to a 24-23 victory. On a snowy Thanksgiving day in Dallas in 1993, the Cowboys were clinging to a 14-13 lead with under 20 seconds left as Miami lined up for a game winning field goal try. 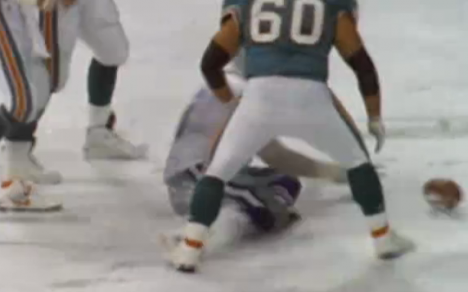 After the Cowboys blocked the kick, apparently clinching a win, Leon Lett inexplicably slid into the football, making it a live ball which was recovered by the Dolphins. Miami made a field goal on the next play to win the game in a most improbable way. 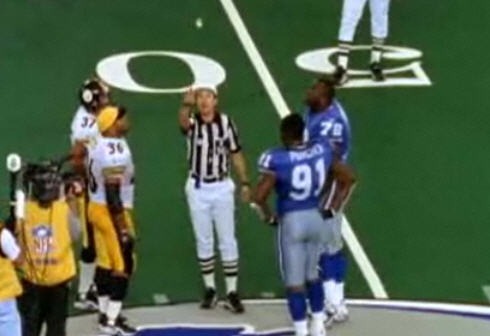 On the overtime coin flip, Bettis can be heard calling “Tails,” but the official claims he said “Heads.” Apparently, Bettis did say heads and then changed it to tails, but all you heard on the audio is heads. The Lions went on to win the game in OT, 19-16. See the video of the coin flip at nfl.com.